A painting by Dutch master Jacob van Ruisdael, made famous by being stolen by notorious Dublin criminal Martin Cahill, has gone on display in Belfast. The Cornfield was offered by the Alfred Beit Foundation in lieu of tax and allocated to the Ulster Museum. It was stolen from Russborough House in County Wicklow three times between 1974 and 2002 but recovered each time. Jacob van Ruisdael is considered by many to be a foremost Dutch landscape painter at that time. The painting was acquired more than a century ago by Sir Otto Beit (1865-1930), joining a collection of old master works assembled by his relative, the diamond magnate Alfred Beit (1853-1906). In 1930, the collection passed to Otto's son Sir Alfred Lane Beit (1903-1994) who relocated it some 20 years later to Russborough House, where the Cornfield hung in the saloon alongside other Dutch paintings. However, the paintings attracted much unwanted attention. An Irish Republican Army gang, that included English heiress Dr Rose Dugdale, stole 19 paintings after tying up Sir Alfred and his wife in 1974. All of the stolen paintings were recovered in County Cork a few weeks later. In 1986, a 13-member gang led by Martin Cahill, known in the tabloid media as 'The General', robbed the stately home again. He took the van Ruisdael as part of a heist involving 18 paintings but the Cornfield was recovered days after the robbery. And finally, the Cornfield was one of five paintings taken from Russborough in 2002 but recovered three months later. Anne Stewart, a senior curator of art with the Ulster Museum, said it was excited and delighted to have a painting as important as the Cornfield in its collection. She described it as an "absolute masterpiece". "Jacob van Ruisdael was really the finest of all the Dutch landscape painters of the 17th century," she said. "This is one of his most beautiful paintings. "Jacob van Ruisdael was so adapt and clever at painting landscapes that he really went beyond the representation of what he saw... he gives it a deeper poetic meaning." While she said it was a very valuable painting, Ms Stewart could not put a value on the piece. She said every museum had concerns about the security of its collections, but that the Ulster Museum had gone to great lengths to make sure its collection was secure. Despite the number of times it has been stolen, the painting is in a "miraculous" condition, she added, although a very close look reveals that the Cornfield does bear the scars of ill-treatment at the hands of thieves. Who was Jacob van Ruisdael? 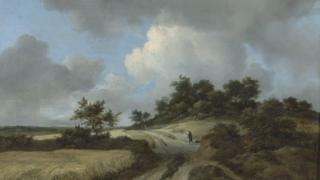 Jacob van Ruisdael (1628/9? - 1682) is commonly considered the foremost landscape painter of the so-called Dutch Golden Age. He was born in Haarlem, in the north of the Netherlands, and was the son of a little known painter, Isaack Jacobsz van Ruisdael. His work is considered to be source of inspiration for later generations of British landscape artists such as John Constable. The subject of the cornfield featured in many of Ruisdael's works but was rarely treated as the central theme. Kathryn Thomson, Chief Executive of National Museums NI, said: "The Ulster Museum holds a small but important collection of 17th Century Dutch paintings and the undisputed beauty of the Cornfield, an important work from the Beit collection, will significantly enhance this collection. "I have no doubt that this beautiful painting will captivate visitors to the Ulster Museum." The Cornfield is on display in the Life and Light Dutch and Italian Painting exhibition at the Ulster Museum. The museum also holds a painting, River Landscape with Figures in Boats and a Church in the Distance from van Ruisdael's uncle and teacher, Salomon van Ruysdael. Although they were uncle and nephew, they used slightly different spellings of their surname.